This week, we pick up with the end of World War II. Let’s start by looking at two very different images of soldiers. 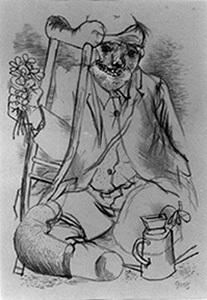 One is by George Grosz, a bleak image of a crippled WW I veteran, reduced to a beggar. 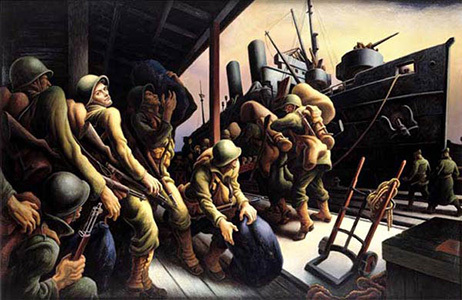 The other, by Thomas Hart Benton, shows heroic young Americans heading off to Europe to fight. By the time World War II is over, neither of these methods of expression seemed adequate to the younger generation of artists. Single events of his war were captured in so many detailed photographs that everyone understood the horror of what the world had gone through. But when it came to understanding the magnitude of the war–6 million civilians killed in the concentration camps, 180,000 killed by a single atomic blast–we humans are simply left contemplating our own inability to conceive of such large numbers. One thing was for sure for the artist’s who became known as the Abstract Expressionists, a new artistic method was required to express this new understanding of the world and our place within it. Before the war, dozens of Europe’s best artists fled to America, creating an artistic atmosphere around New York perfect for the education of our young artists. We look at two artists: Arshile Gorky and Hans Hofmann, and their influence on the Abstract Expressionists. We then systematically dissect works by the most prominent of these figures, looking for two things. First, what was their artistic intent, and means of production? Some of these artists were only interested in what paint on a canvass meant in and of itself. Some were interested in exploring issues of social justice, and some were convinced that with color alone, they could create a truly spiritual and transcendent experience. Whether formalist or metaphysical in intent, all of these artists had an interest in the abstract gesture (except, as we learn, Ad Reinhardt, the exception who proves the rule). Our second desire in this class is to begin to examine this gesture as a signature mark of the artists. Our class is as much a field guide as it is history. And we must look at these works not just as individual pieces, but as parts of the artists’ oeuvre, or body of work, and learn to spot other works with these same signature gestures, signature colors, signature compositions. Didn’t post WWII abstract expressionist painting evolve from nihilism reborn from artists’ revulsion to the cruelty and hopelessness of the war as it had been after WWI? This was a 180 degree turn from the idealism embedded in the surrealist paintings between wars. 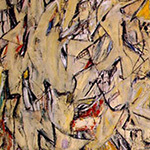 Couldn’t the effect of WWII on abstract expressionism be what inspired these artists to experiment with tools and techniques that would express the meaningless of our lives? I’m not sure I would use the term nihilism to sum up the Abstract Expressionists. It’s a tricky word, and means a lot of different things to different people. When it comes to turning away from the optimism of the social realists, yes, they did seem to throw doubt on the very notion that humans were by nature heroic, or even “good”. But nihilism, particularly existential nihilism, argues for the meaninglessness, or insignificance of life. If you look at Sartre’s essay that we read last week, I think he is actually arguing against this reading in his brand of existentialism. He’s actually saying that anxiety comes from realizing every choice we make has SO MUCH meaning. And I think that the AbExers were looking to make artwork that expressed this heavy sense of meaning, of purpose in the world. What you are describing definitely fits the noise poems etc. of Dada after the First World War, and certainly there was influence from Dada that made it’s way to New York in the 50′s, although probably via surrealism. You could also argue for instance that Pollock’s intense alcoholism was a form of nihilism, even though some say his best painting came during the years when he was sober. But Rothko’s Chapel for instance, definitely shows an intention to create spiritual meaning, or even transcendence in the viewer. I almost wonder if you could summarize the AbEx zeitgeist as some sort of collective post-traumatic stress. If it has a component of numbness, or nihilism, it also has a deep and passionate, perhaps unravelled, emotional side as well. I’m curious in next weeks material, if you notice any of this nihilism in Warhol’s persona.